And then I found this recipe on Food.com. It was simple (so it didn’t involve two different kinds of fat, three different kinds of flour, and the tears of virgin unicorns), it was fast, and it had rave reviews. So I decided to give it a shot. 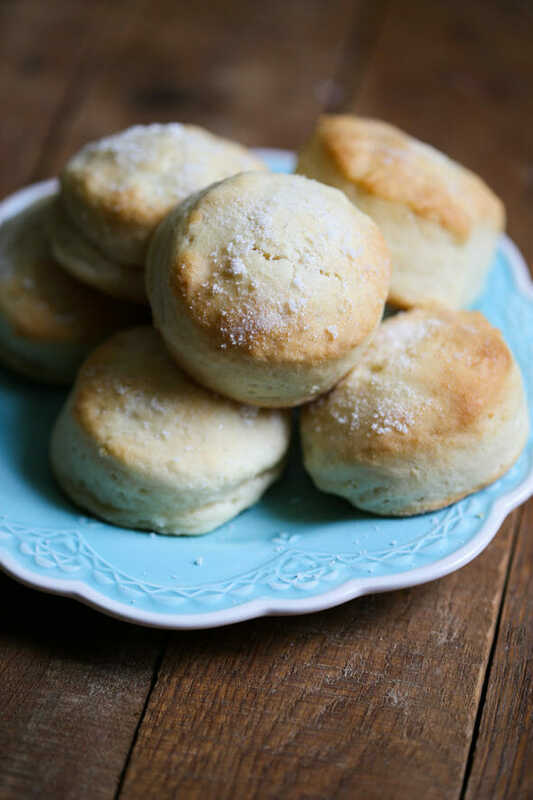 And these biscuits were everything I was hoping for–quick and easy, fluffy and layered (but not too flakey), perfect for butter and jam or biscuits and gravy. Preheat your oven to 450 F and line a baking sheet with parchment or a silicone baking mat. 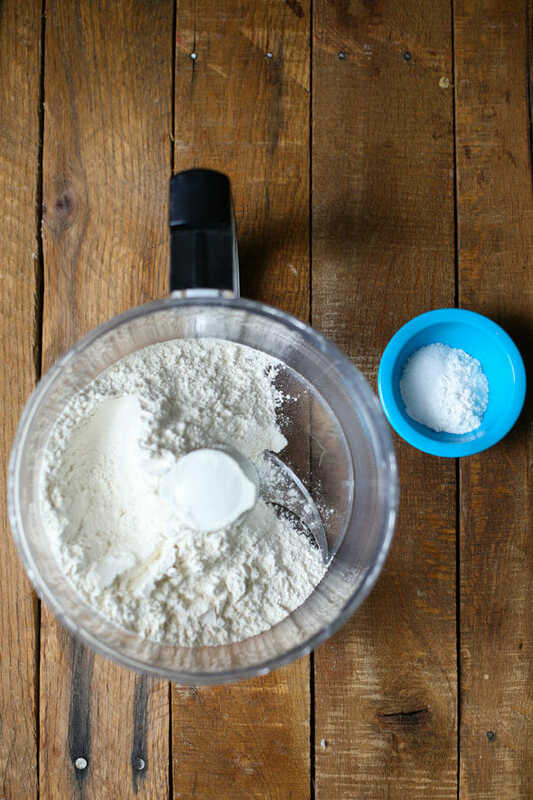 You’re going to need 2 cups of all-purpose flour (lightly spooned into measuring cups and leveled with a knife), some baking soda, baking powder, and kosher salt. and pulse the dry ingredients a few times. Then chop up 6 tablespoons of cold butter. Add the chopped butter to the flour mixture and pulse until it resembles coarse meal. Add 1 cup of buttermilk or plain kefir (remember when I talked all about that here? Yeah, that happened.) Pulse until just combined. The mixture should be quite moist and sticky. Flour a work surface and turn the dough out onto the floured surface. 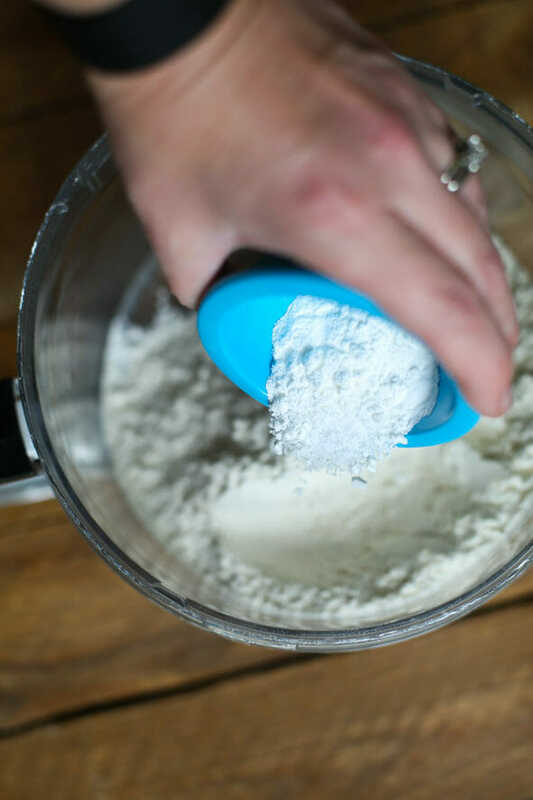 With floured hands, gently pat the dough down until it’s about 1″ thick. 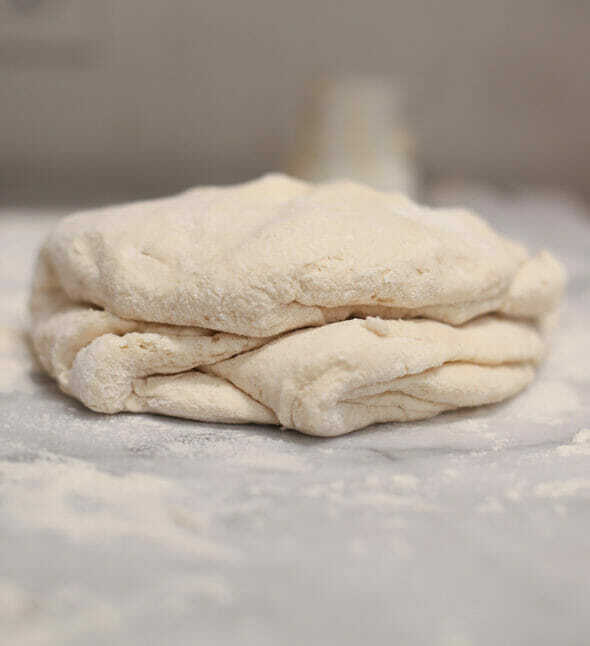 Fold the dough in half horizontally, then vertically, repeating until you’ve folded the dough 5 times. Gently pat (don’t roll…just leave that rolling pin alone and no one will get hurt) the dough into a disc about 1″ thick. Be sure to handle the dough as little as possible–the less you touch it, the better your biscuits will be. Using a biscuit cutter that’s about 2″ in diameter, cut the biscuits out–I get about 8, then gently press the scraps together and can get two more biscuits that aren’t nearly as soft and delicious as the first 8. Place them on the baking sheet. These will not spread at all, so you can stick them close to each other–the closer they are, the softer they’ll be. I could have gone a little closer. I like my biscuits soft. If you want, brush some melted butter on top and sprinkle them with a little sugar. It’s hard to go wrong with butter and sugar, even if you’re planning on going savory with these guys. Bake the biscuits in the preheated oven for 10-12 minutes or until just golden on top–you really don’t want to overbake them. Remove from the oven and serve however you want–hot, cold, right now, tomorrow. It doesn’t matter. You made biscuits and you should get a medal. Place dry ingredients in the bowl of a food processor fitted with a chopping blade and pulse a few times to combine. Add chopped butter and pulse until the mixture resembles coarse meal. Add buttermilk and mix until just combined. The mixture should be very moist. Dust a work surface with flour and dust your hands with flour. Transfer the mixture to the floured work surface and gently pat until about 1″ thick. Fold the dough in half horizontally, then vertically, repeating so you fold the dough a total of 5 times. Gently pat into a circle about 1″ thick and use biscuit cutters (I use 2″) to cut the dough. You should be able to get about 8 biscuits, then gently pat the scraps back together and cut two more biscuits. Place close to each other on a baking sheet and brush with melted butter and lightly sprinkle with sugar. Bake for 10-12 minutes or until the tops are golden. Remove from oven. These can be served at any temperature. The key to these biscuits being light and fluffy is handling the dough as little as possible. Mix, fold, and press the dough just enough to get the job done. Southern style biscuits are my FAVORITE and (like you) I have not been able to find the ‘right’ recipe – but these ones look absolutely PERFECT! I can’t wait to make them! I am so excited to try these biscuits. I have been looking for a great recipe and this looks like a winner. I have been doing the folding of the dough for a good while now. That when when my biscuits improved the most. Much more light and tender now. Love this method. I do make mine a little thicker. Ingredients are almost the same as yours. I use self rising flour and also add more baking powder to them even though the flour already has levening. I just left a comment and it disappeared. I also do the folding of the dough. Has made my biscuits better than ever. I use self rising flour and still add more baking powder. Works great and they are so light and tender. I make mine a little thicker too. Question on the number of times for folding: Does the “horizontally and vertically” count as one fold? Or do you count every folding motion until you have folded it 5 times? I know it is important to not over work the dough—thanks for clarifying it for me! I know, it’s kind of confusing, haha! Each fold counts as one, so horizontal (1), vertical (2), horizontal (3), vertical (4), horizontal (5). Hope that helps! Wow! I can not tell you how elated my children will be if I can learn to make biscuits! They absolutely love them and my first attempt failed. Also thank you for the heads up on kefir. I read that post and was so excited that a bottle of kefir now plants itself in my frig. I make your caramel syrup on a regular basis. My son will eat nothing else. And again I must mention that I am currently making your crayons/pretzels for the start of the school year. It is now my tradition and the neighbor kiddos ask and expect them. You guys are the best! I have a trick (I’m pretty sure I learned it here? with a scone recipe?!) 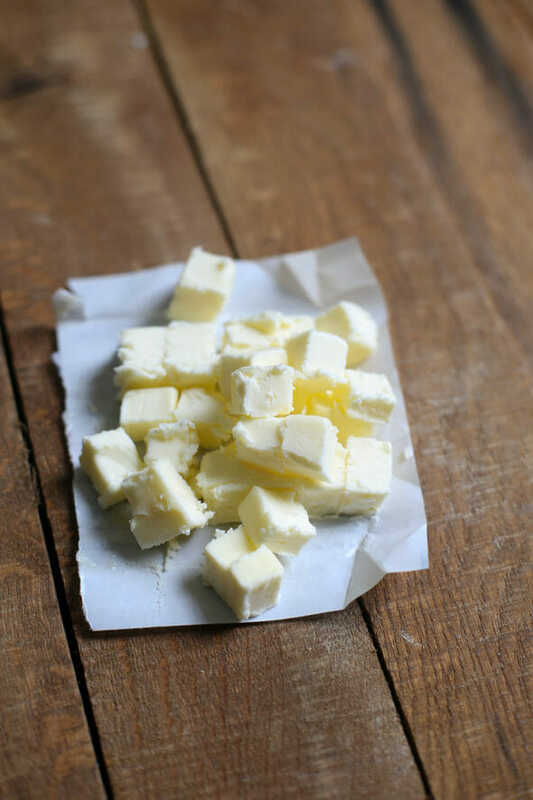 for making flaky biscuits when I don’t want to haul out the food processor: before I start with the dry ingredients, I grate butter that is frozen and then put the bowl of frozen and shredded butter back into the freezer. 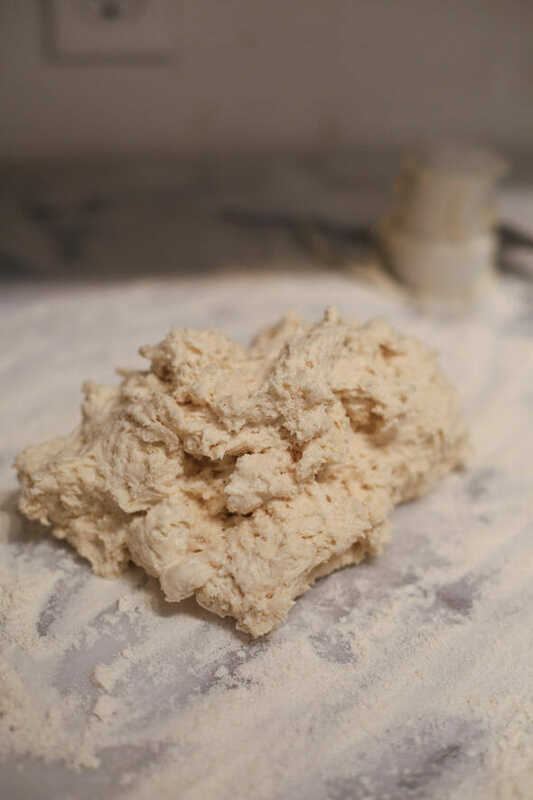 Once the dry ingredients are measured and whisked together, I toss in the frozen shredded butter and quickly distribute it, add the liquid ingredients and handle the dough quickly and lightly and get it in the oven fast. Would mixing it in a stand mixer be okay? I wouldn’t. 🙂 If you don’t have a food processor, you’re better off just very lightly mixing the dough by hand. These are similar to Betty Crocker’s buttermilk biscuits I’ve been making for decades. I usually cut my dough into squares just so I won’t have any scraps left (the scrappy ones just aren’t as wonderful, are they? ), although the round ones are prettier. 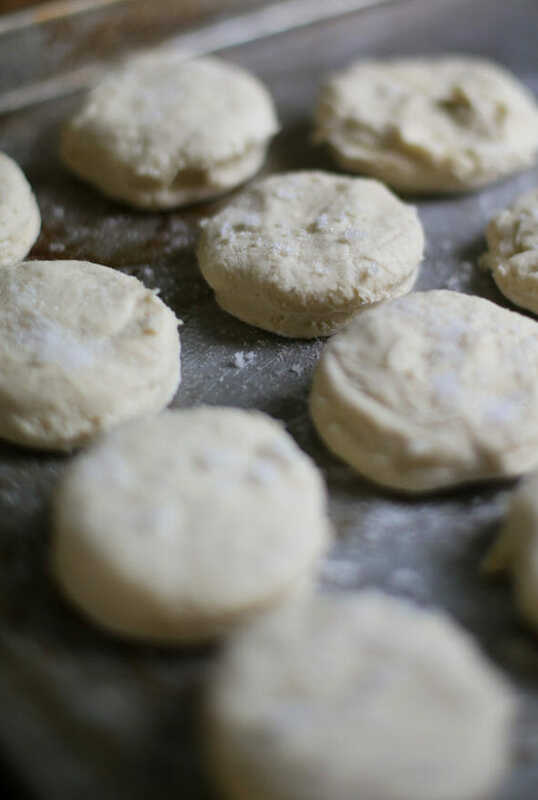 I adore buttermilk biscuits–and I’ll try yours to compare. Butter ‘n honey ‘r jam, yum! Kate – you crack me up! “Tears of a virgin unicorn!” Even if I never make the biscuits, I love your writing style, you truly have a gift and tonight you made me laugh. Thanks! I like to take the scraps and cover them in sugar and cinnamon and bake them as a treat since they don’t make as good a biscuit….and I double this recipe. Oh sweet glorious carbs! Will I ever be done dieting and be able to make these? You guys rock, did you know that? I just made these tonight along with the sausage gravy. I had no idea I could make biscuits. Thanks for the easy to follow instructions – I’m always surprised when my attempts look like the real deal! Hooray!!! But seriously. Successfully making your own biscuits feels kind of amazing. I doubled this recipe and when I dumped it from the food processor, the dough was so wet. Incredibly wet. I had to continue to sprinkle on flour to make it manageable. I double checked the amounts each time I added anything since it was a new a recipe and the amounts were all correct. The finished product still tasted good(hello butter!) but didn’t look pretty. Any thoughts as to what could have been my issue? I’m always nervous about doubling recipes like this because it seems like they never come out quite right. If I had to guess, it would be that doubling was the problem, but if you try that and they’re still wet, you might just need to add more flour. So sorry I can’t be of more help! My mom made southern biscuits that were so light and delicious but mine never turn out as good. I’m hoping this recipe does the trick. I am wondering if i could pinch off pieces of dough and gently roll the biscuit in my floured hand before placing in the pan rather than folding and cutting. I did not double the recipe and it was SUPER wet. I ended up having to manhandle it a lot while it was on the counter trying to add enough flour that it was even possible to fold it. They still turned out ok, but not very flaky. I’m going to test it and make sure it will at least hold a shape before dumping it out next time. Holy moly! Amazing! I made these for biscuits and gravy and they were perfect! I didn’t have buttermilk (for the BUTTERMILK biscuit recipe, I know!) but I just read about using sour cream or plain yogurt mixed with milk as a substitute and they turned out soooo good! My dough was also really wet, but I had faith in the process and between a liberal dusting of flour and my trusty bench scraper I managed to make biscuits that were soft and flaky on the inside and just a little crispy and golden brown outside. Yum. These cooked up beautifully despite only having my humble pastry blender. So glad to find something that tastes like my childhood (but without the weird filmy-mouth thing the can-biscuits have)! Great recipe. Followed it to a T! I made these last night for the first time and my husband said they were the best biscuits I’ve ever made. My kids agreed – they said I need to double the recipe next time. 🙂 This will definitely be my new go-to biscuit recipe! WONder how these would be in a dutch oven? Need a good recipe or biscuits and gravy. Now i just we’d a long eXtension cord or the food processor. ha!